I was headed to a friend's birthday party and I knew I had to bring these cupcakes. 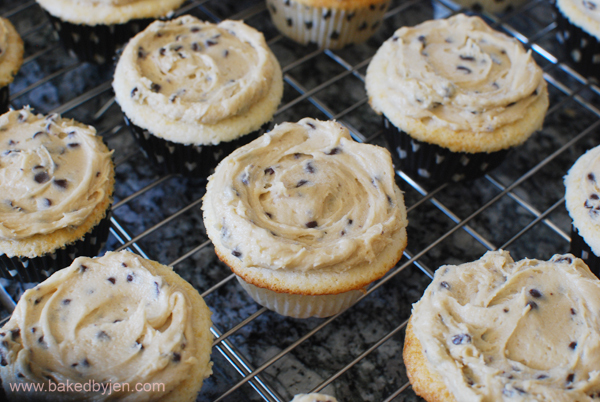 I have been eyeing the cookie dough frosting since I saw them on Sally's Baking Addiction. I am guilty of sampling cake batter and cookie dough while baking and this frosting is exactly like the real thing but minus the raw eggs. I used an apple corer on the cupcakes in order to give them just a bit more frosting after realizing that the cupcake itself wouldn't hold up to a pile of heavy frosting. I wish I went with a more sturdy and dense cupcake, ie. yellow cake. The white cake was too fluffy for such a rich and heavy frosting. But, it sure balanced out the sweetness perfectly. Beat butter and brown sugar in a mixer until light and creamy. Add vanilla extract. Add the flour and salt, continuing to beat until no white streaks are visible. 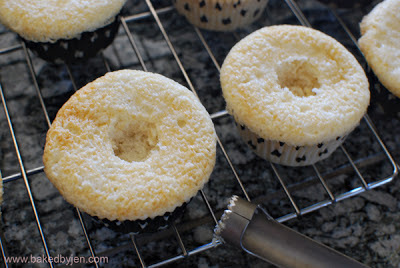 Stop and scrap down the frosting as necessary Add milk 1 tablespoon at a time until a creamy consistency is reached. Stir in by hand the mini chocolate chips. Frost as desired. Frosting keeps at room temperature in an airtight container for up to 3 days. A friend's birthday was around the corner and she was looking forward to some mint oreo cheesecakes that I have made previously for a holiday potluck which she loved. Of course, I couldn't just settle with the same dessert. 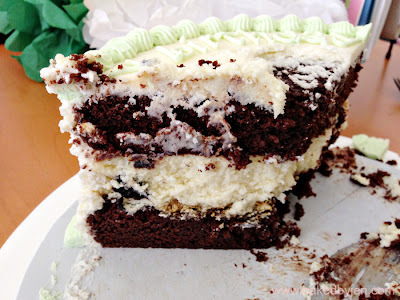 I went with a tried and true method of inserting the mint oreo cheesecake in between two layers of chocolate cake frosted in a vanilla cream cheese buttercream. 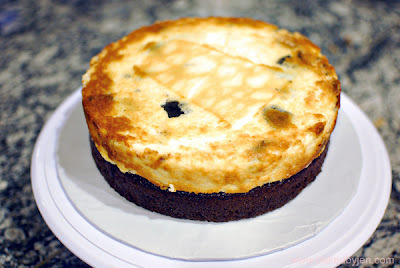 I have previously used this method with my red velvet cheesecake cake and strawberry cheescake shortcake cake with great results. 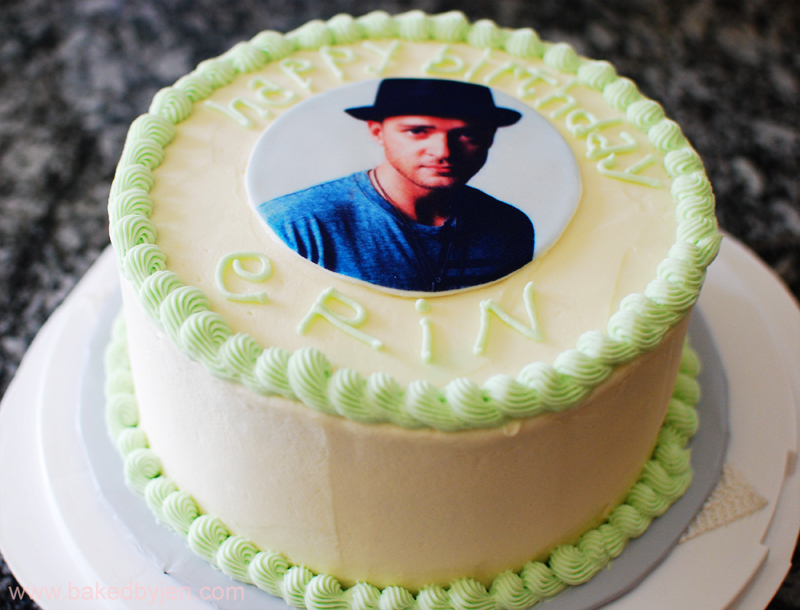 To add an additional element of surprise, my future sis in law, over at The Buttercup Baker, helped transfer an image of Justin Timberlake (birthday girl's celebrity crush of all time) onto an edible icing sheet for me. I never worked with it before and I am glad it was really easy to use. I didn't place it right onto the frosting but onto a piece of fondant. I had no issues with the image bleeding despite being in the fridge over night and most of the day. It has been quite awhile since I made a cake for Cake4Kids.org. So, I made sure to sign up this month for one of the cake requests. 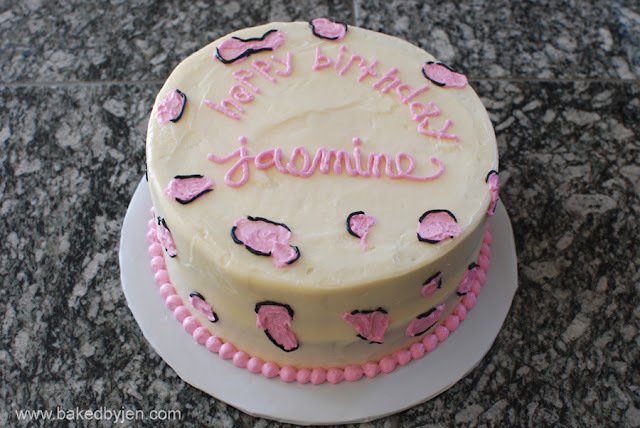 This request was for a yellow cake with pink and white cheetah print. I don't seem to have the time or patience for fondant nowadays so, I went with my go to yellow cake and frosted and decorated with my go to vanilla buttercream frosting. The cake did take a bit longer to make as it was 90+ degrees and even at 9pm, it was way too hot to frost a cake. So, it had to go back and forth from the fridge to the counter. Eventually, it set up enough for me to decorate. I could've added more "spots" as I realized it looks more like cow print than cheetah/leopard print now. Hope she enjoyed it regardless. Inspired by Sally's Baking Addiction's blog post of the same, I made brownies with Oreos in the middle for a picnic at work. 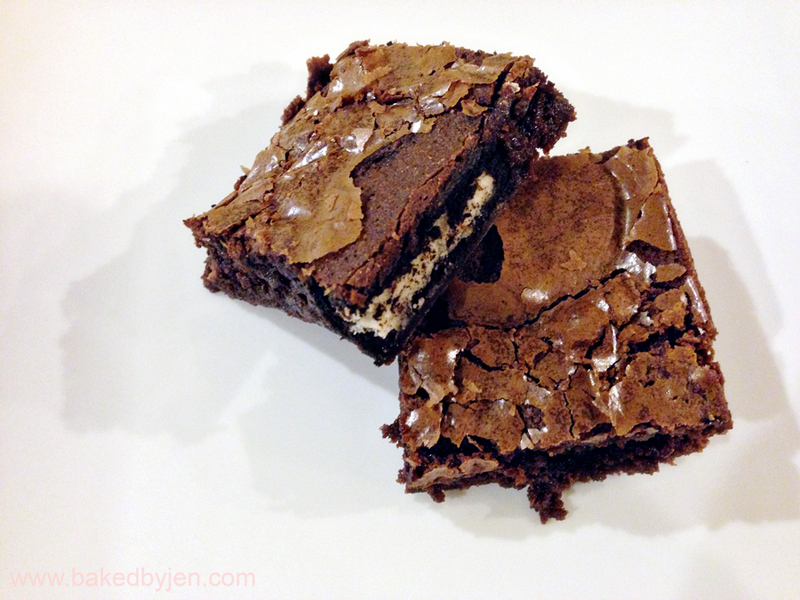 I used my go to brownie recipe but you can definitely make this with a box mix too. 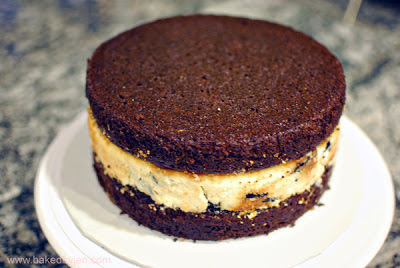 The cookie layer disappears into the brownies and the creamy center adds an extra layer of sweetness to the chocolate. This was definitely a favorite all around.